Ontario Equestrian administers education and training programs as well as evaluations for coaches to become nationally certified in our sport. 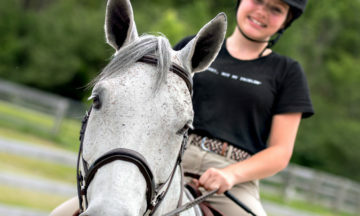 The Equestrian Instructor and Coach Certification program follows the National Coaching Certification Program (NCCP) guidelines established for all sports in Canada – sharing the knowledge and expertise of coaching excellence across the country and among sports. Instructor and coach certification is available through the Competition Coach and Competition Coach Specialist levels within the following disciplines: Eventing, Dressage, Hunter/Jumper and Reining. The process to certification is explained in our Guide to Coach Certification which includes a description of required and recommended steps toward certification. Join the program to achieve your professional credentials as a Certified Equestrian Coach. We also receive generous support from the Coaches Association of Ontario and the Coaching Association of Canada, who offer funding, mentoring and training opportunities to our organization and/or to coaches directly. Training and Education is available online, in our training room and on-site with our Facility Partners. You can find all of our scheduled training opportunities in our events calendar. If there is a specific course you are interested in, please contact our Coaching Coordinator at c.szafranski@ontarioequestrian.ca. Certification sessions are scheduled as Instructors and Coaches have completed their pre-requisites and are ready to be evaluated. Please contact our office at c.szafranski@ontarioequestrian.ca when you’re ready to take this next step and our Coaching Co-ordinator will advise you of upcoming opportunities for certification. The Ontario Equestrian Coach of the Year is celebrated every year at the Royal Agricultural Winter Fair. All certified instructors and coaches are eligible to be nominated (with their consent). Each year we receive incredible testimonials celebrating the skills and passion of Certified Coaches and Instructors. If you want to nominate your coach, look for the nomination form here in September of each year and tell us why you think your coach should be selected as the Ontario Equestrian Coach of the Year. A selection panel of Coach Developers (the Coaches who train and certify new Coaches), from across Ontario come together to review the nominations and select the most deserving Coach of the Year. Celebrate your certification and promote yourself by wearing the NEW Ontario Equestrian Certified Coach jacket! Only those who are certified coaches or instructors will be eligible to order this jacket, with personalized name included in the price.